We are here to make a change. We aim to show the world how the more sustainable also can be more functional, last longer and even cooler. We have a cyclic holistic approach from raw materials to business model, and we can take full responsibility for the state and function of the furniture over time. Green Furniture delivers to large public interiors. This means we have few but large customers, and that we have time and ambition to listen very carefully to these specific demands, learn their their business, and improve their sense of place, customer satisfaction and sales. The furniture is in for a long term smooth relationship, with timeless design, ability to stay in shape as new and to change with the building over time. We call it “impression that lasts”. We make modular bench systems for grand seating in scale with grand indoor spaces. 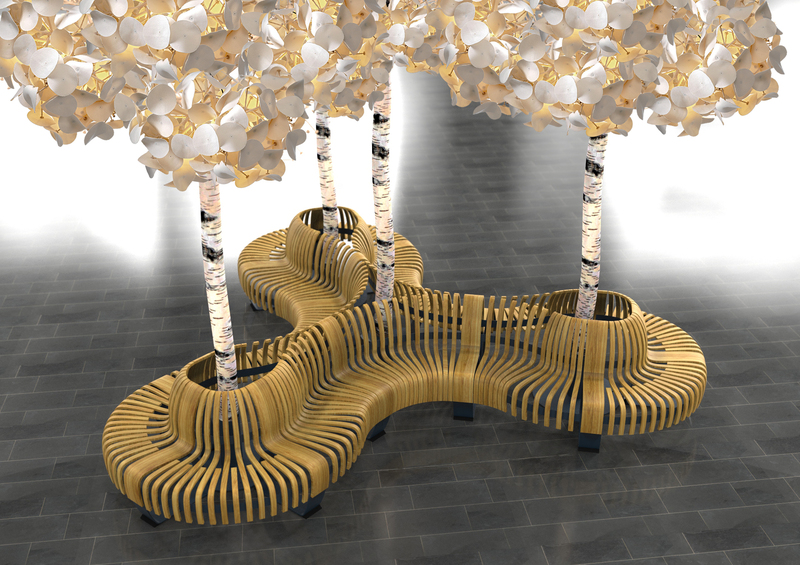 Benches that shape a seamless seating line and can take any creative form. In practice this means that we make room for seating 30-50% more people on a given area*. The seating can take the size and shape of the room, go with the flow of the place, and tune to the local colour scheme – we make places, not just seats. We also make Grand acoustic lighting in the shape if trees and pendant tree foliages. Natural ambiance-shapers to the room, both visually and acoustically, creating feel good places ‘in the shade of the trees’. Leaves of wool, placed as a foliage labyrinth, give excellent sound absorbing and diffusing qualities – it eats echo. Proximity to people makes the perceived effect even stronger.